When Guus Hiddink took over at Chelsea, just before our game on Boxing Day, I certainly didn’t expect that when our home game came around they would still be unable to catch us in the table regardless of the result. Since this was a televised game, we were able to watch the build-up on TV in the West Herts, but unable to hear what Flores had to say in the pre-match interview although the pictures were rather evocative showing his flamenco dancing aunt and plenty of Flores hugs. Team news was that Flores had made just the two forced changes, with Britos unwell and Aké ineligible, Holebas and Prödl were in to replace them. The starting line-up was Gomes, Holebas, Cathcart Prödl, Paredes, Capoue, Watson, Behrami, Jurado, Deeney and Ighalo. Watford started well as a promising attack from Costa was stopped by Prödl, his forward pass to Deeney was headed down to Ighalo whose shot was deflected for a corner. 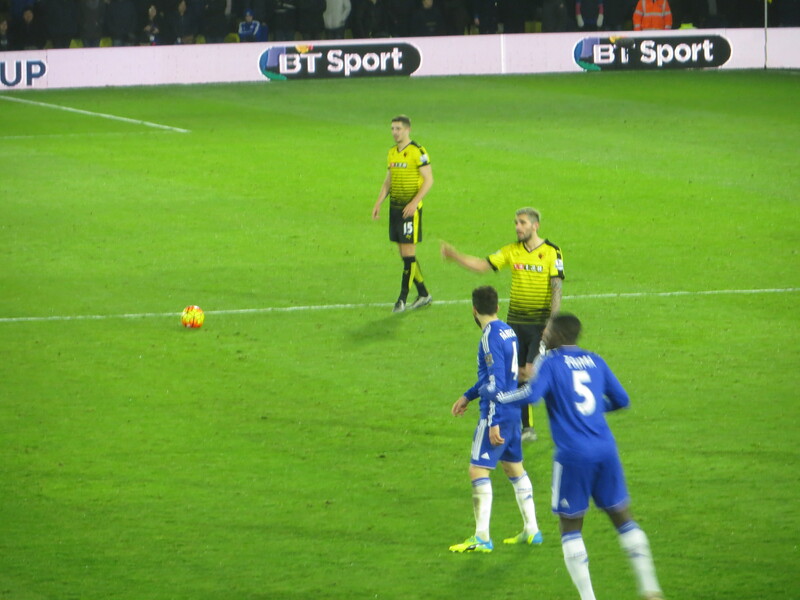 Costa’s reputation goes before him, so it was pleasing from a Watford perspective to see an early dramatic fall ignored by Mike Dean, leaving him sitting on the turf while Watford broke back upfield. He stayed on his feet in his next move and broke into the box, but Cathcart was on hand to block. At the other end, Jurado released Capoue who won a corner from which there was a bit of a goalmouth scramble with three attempted shots, but the ball ended up in the arms of Courtois. The first booking of the game went to Prödl who was penalized for a late challenge on Oscar. 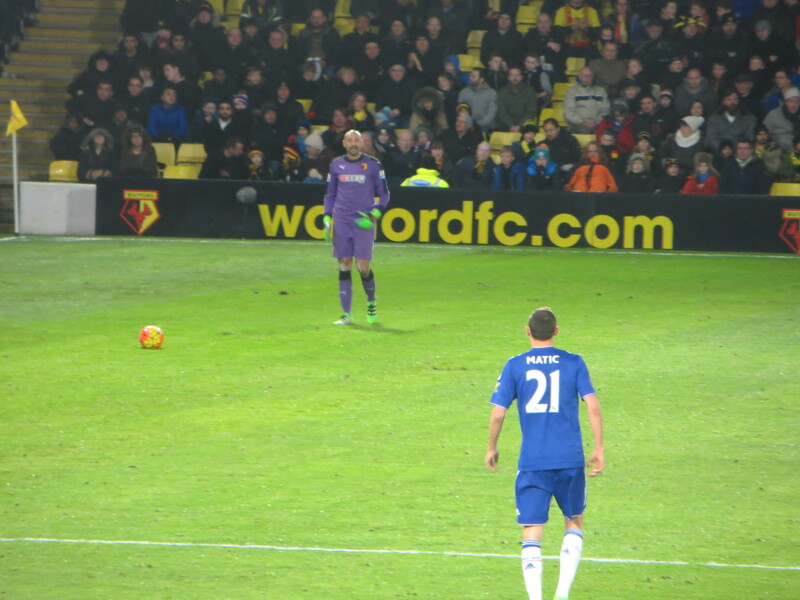 A dangerous free kick from Holebas was deflected in the direction of Capoue but Courtois gathered. The first sight of Watford substitutes warming up is usually greeted with polite applause, but the reaction this evening was more enthusiastic than usual due to the presence of our new signing Mario Suárez. There were some hopeful shouts for a penalty from the home fans as Jurado appeared to be tripped in the box by Matic, but all appeals were waved away. The Watford forwards combined as Deeney found Ighalo in the box, but his shot was blocked. There followed a lovely sequence of passes around the midfield from the Hornets which drew cheers from the fans before Holebas broke forward and crossed towards Ighalo who was unable to connect. Ighalo then battled into the box but his shot was blocked for a corner which was taken by Watson and met by the head of Prödl, but Courtois leapt to catch. There was another chance for the Hornets as Deeney flicked the ball on to Ighalo but the Nigerian didn’t connect properly so it was easy for the keeper to gather. Jurado, who had been impressive, beat a couple of players before feeding Capoue who unleashed a fierce shot that drew an instinctive save from Courtois. 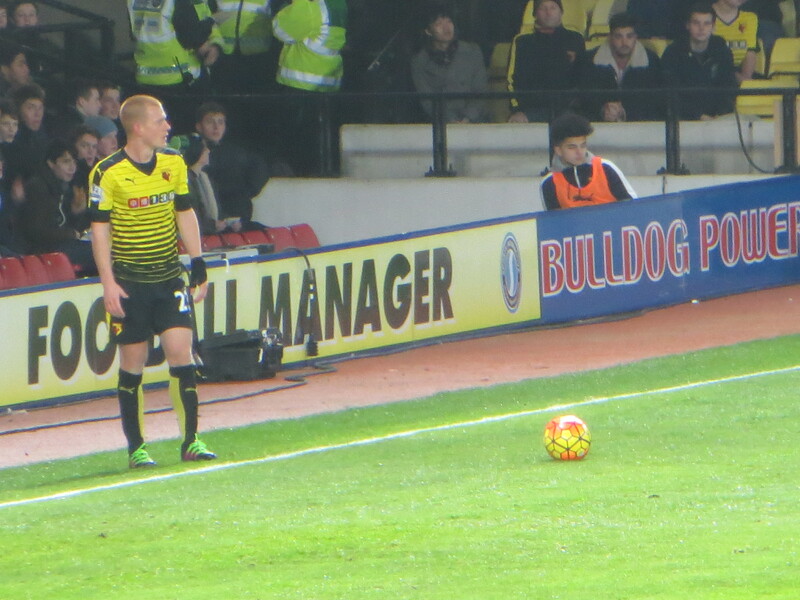 A Watford free-kick was cleared only as far as Jurado who tried an overhead kick that was easily caught. At the other end a long pass from Fabregas released Costa whose shot was deflected wide. Chelsea had another chance with a shot from Oscar that was blocked by Prödl. Then a moment of brilliance from Ighalo, who looked to be in a hopeless situation with two Chelsea players on him, but somehow managed to escape upfield before letting himself down by playing a terrible ball that was intercepted. “That’s why he doesn’t pass” was the conclusion of a wit behind me. With 5 minutes remaining of the half the Chelsea fans could finally be heard, but they were belting out a lengthy song about Frankie Lampard, which seemed rather odd under the circumstances. Another break into the box by Holebas ended when he was tripped, but nothing given. 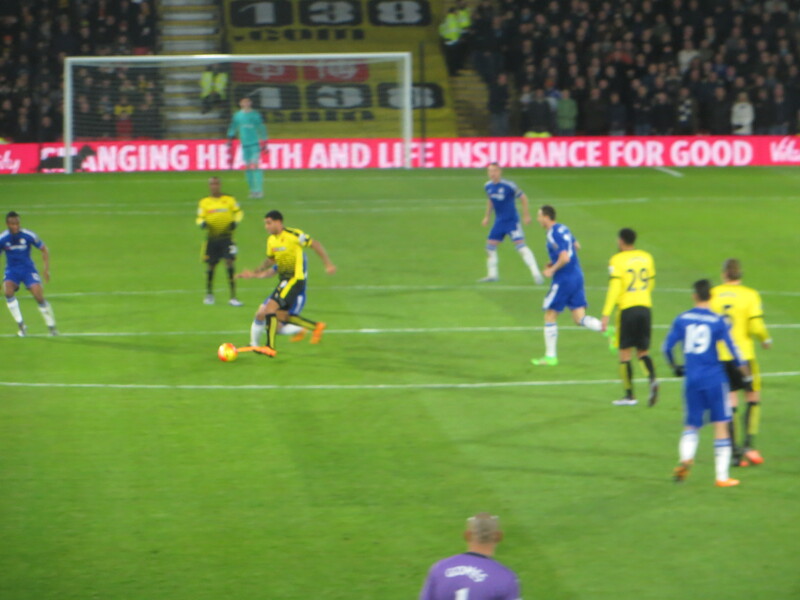 Then there was danger for the Hornets as Paredes played a poor pass to Capoue who failed to control which allowed Oscar to escape with the ball before finding Azpilicueta who, much to the relief of the home fans, shot wide of the far post. The fourth official indicated a minute of added time at the end of the half, but that was extended considerably following an off the ball incident between Costa and Paredes. I didn’t see what happened, but the Ecuadorian had collapsed holding his face and many around me were calling for a red card. Costa had to be calmed down by a number of people, including Flores, and, eventually, both players ended in the referee’s book. The post match consensus seemed to be that Paredes had over dramatized the contact. Much as I dislike that aspect of the game, it was hard to sympathize with Costa, a definite case of the biter bit. When the half time whistle finally sounded, Watford had been the better team. We were playing some lovely football, but I was particularly pleased to see that our defence was organized and joining with the midfield to harry the Chelsea players and not allow them to get comfortable on the ball. Also, Jurado, who is a marmite player for the Watford fans, was combining really well with Ighalo and Deeney. It had all been very pleasing apart from our inability to score. The half time draw was carried out by Nathan Aké. The usual interview was rather engaging, so I think he was a little taken aback when Tim finished by asking whether if Chelsea got relegated there was a clause in his contract that allowed us to sign him permanently. He laughed that off, but we can only hope. Gomes had nothing to do in the first half, but was called into action early in the second period as a shot from Mikel took a nasty deflection and appeared to be looping in when the Brazilian leaped to tip it over the bar. At the other end, Behrami’s pass towards Ighalo was met by Zouma who could only head clear as far as Deeney whose volley was just wide of the target. Holebas made a menacing run into the box, exchanged passes with Capoue but his run gave him too narrow an angle and he shot into the side netting. 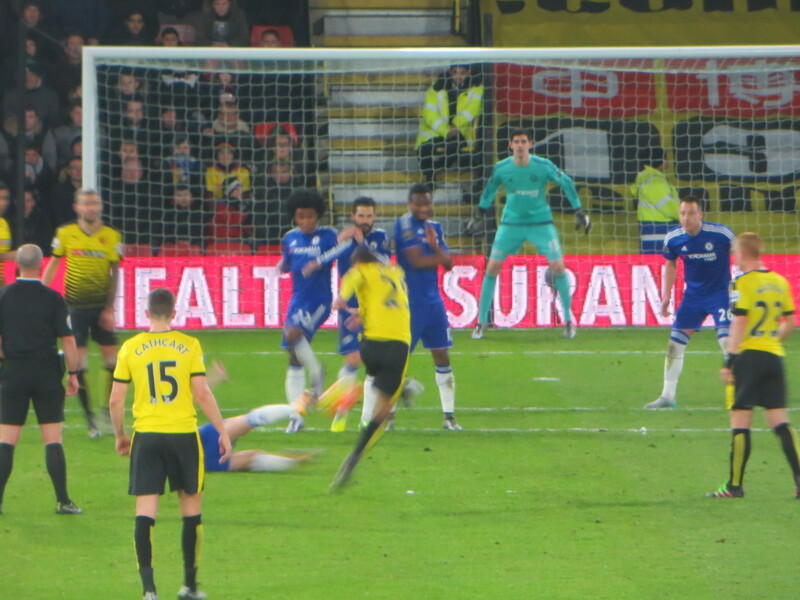 Watford looked to be in trouble as Gomes left his goal to try to stop Costa on the byline, but the striker succeeded in cutting the ball back to Oscar who, thankfully, put his shot wide. There was a lovely break from Jurado, but his cross was too deep, flying over Ighalo’s head, and there was no other Watford player in the box to meet it. At the other end, a clearance dropped to Matic whose shot was easily gathered by Gomes. 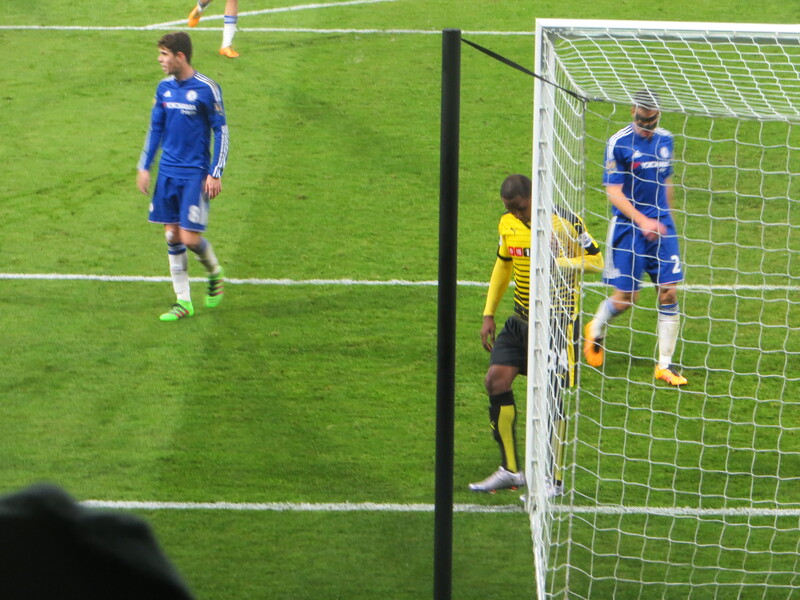 For Watford, Holebas found Ighalo who was prevented from doing any damage by a challenge from Terry. At the other end, Costa was equally frustrated by Prödl, who was having an excellent game. Just after the hour mark, Flores made two substitutions in quick succession. First Abdi replaced Jurado, who had been superb so went off to loud cheers. Then Nyom replaced Paredes. Oscar tried to threaten the Watford goal as he cut inside and shot, but Gomes made the save. Chelsea’s first change came with 20 minutes to go and saw Matic replaced by Hazard. The Belgian was immediately involved, playing a ball to Ivanovic whose shot was tipped around the post by Gomes. The Watford keeper was having a much busier second half and had to be alert again as Willian found Hazard, but Gomes was out to save at his feet. My nerves were becoming a little frayed at this point at the possibility of Chelsea nicking the game, and were severely tested when Hazard crossed to the far post but, thankfully, Costa shot into the side netting. Flores gave new signing Suárez a brief run out as he came on to replace Capoue to great cheers. Chelsea nearly won it at the death as a cross from Willian was headed goalwards by Costa. From the opposite end of the ground it looked in all the way until a purple blur appeared and there was Gomes flying through the air to make a superb save and ensure that the Man of the Match award went his way. So a second point won from the defending Champions this season in the most entertaining 0-0 you will ever see. While the visitors had the better of the second half, as the Hornets tired, a draw was probably a fair result. It had been a tremendous performance from the Watford lads who never looked out of place against their supposedly more illustrious opponents. The memory of watching Costa charging into the box to be met by Cathcart who then calmly took the ball off his feet still makes me smile. The point took us to 9th in the table and we are 12 points clear of the drop zone with 14 games remaining, which is a position that would have been beyond my wildest dreams at the start of the season. When I got back from the game, I was finally able to watch the pre-match interview with Flores and fill in the blanks. It didn’t disappoint as he spoke of the pride in his family and the emotion when his lovely aunt was commemorated with a Google doodle in Spain. He spoke of the fact that, with many nationalities and mentalities in the squad, you have to touch the players’ hearts to make them most effective. His last comment of the piece was in relation to his time at Watford and he said, “This is the right place to be happy.” And so say all of us, Quique. This entry was posted in Watford FC and tagged Allan Nyom, Almen Abdi, Ben Watson, Branislav Ivanovich, Cesar Azpilicueta, Cesc Fabregas, Chelsea FC, Craig Cathcart, Diego Costa, Eden Hazard, Etienne Capoue, Guus Hiddink, Heurelho Gomes, John Obi Mikel, John Terry, Jose Holebas, Jose Manuel Jurado, Juan Carlos Paredes, Kurt Zouma, Mario Suarez, Nemanja Matic, Odion Ighalo, Oscar, Quique Sanchez Flores, Sebastian Prodl, Thibaut Courtois, Troy Deeney, Valon Behrami, Watford FC, Willian on February 5, 2016 by franelynn.